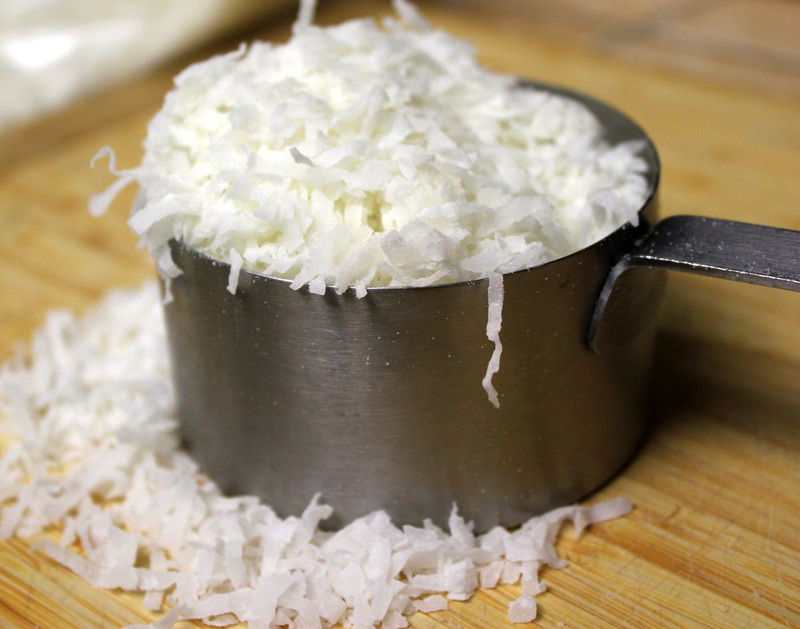 Ever since I made the German chocolate cupcakes for our Noktoberfest party (see post Lederhosen and Lebkuchen), I’ve had an abundance of sweetened shredded coconut in my pantry. Since I’m not usually a fan of coconut and the shredded coconut isn’t a regular pantry staple at our house, I’ve been looking for something else to make with all the leftover coconut besides simply making the German chocolate cupcakes again (which was tempting since they were pretty tasty). 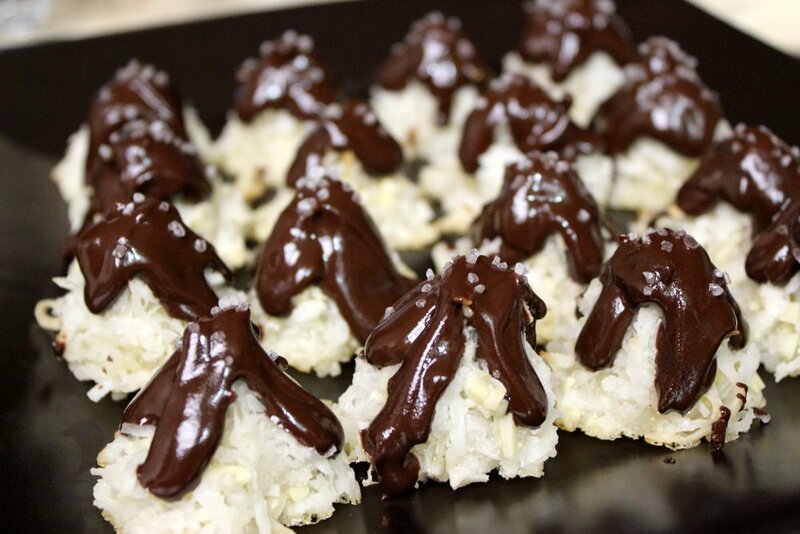 And then I came across these Snow-Capped Macaroons on The Bitten Word made from this Food Network Magazine recipe. The cookies looked simple and delicious, and I already had the coconut so I was ready to go. Besides, I was inspired by all the snow we were getting in the Sierras and knew it would mean even more great skiing in the days to come. Jan and I already had a few good cross-country and downhill ski days in, and with all the new snow, I knew there would be plenty more in the future. Making cookies that resembled the snowy peaks seemed like the perfect way to welcome more snow. 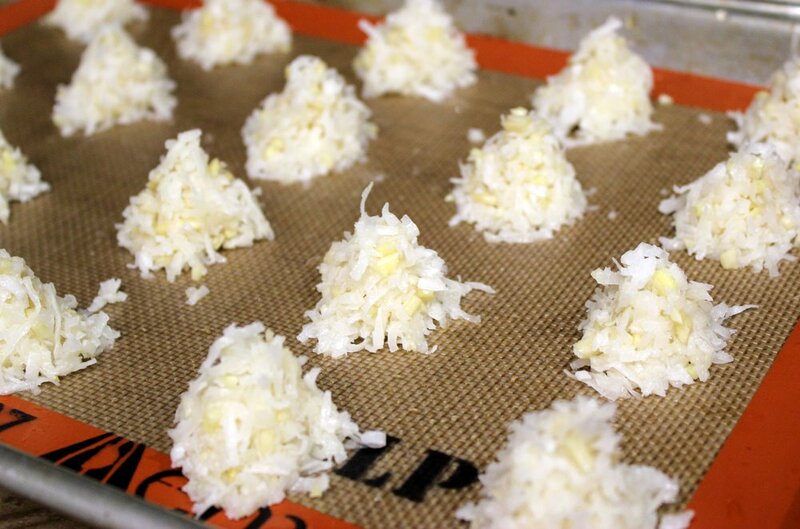 To make the cookies, I beat egg whites until frothy, added sugar, chopped almonds, vanilla, salt, and the shredded coconut. Atop my new favorite kitchen tool the Silpat mats, I used a tablespoon to measure out the cookie mounds. Then, after dampening my fingers with water, I formed the mounds into little cones. Chewy but with a firm but flexible chocolate crust on the outside, the cookies tasted as good as they looked. Jan described them as tasting like a Mounds candy bar, so I was pleased. The next day, I took some of the cookies in my backpack for another cross-country skiing adventure. Jan and I departed from the Tamarack Ridge Trailhead, about 10 miles north of Shaver Lake in the Sierra National Forest. Because the snow was fresh, deep and powdery, it wasn’t long before the groomed trail ended, and then after that, not even the snowmobiles could traverse the trails. So, about mid-thigh deep in snow, we made the path that looped back to the trailhead ourselves, and it was certainly a workout. 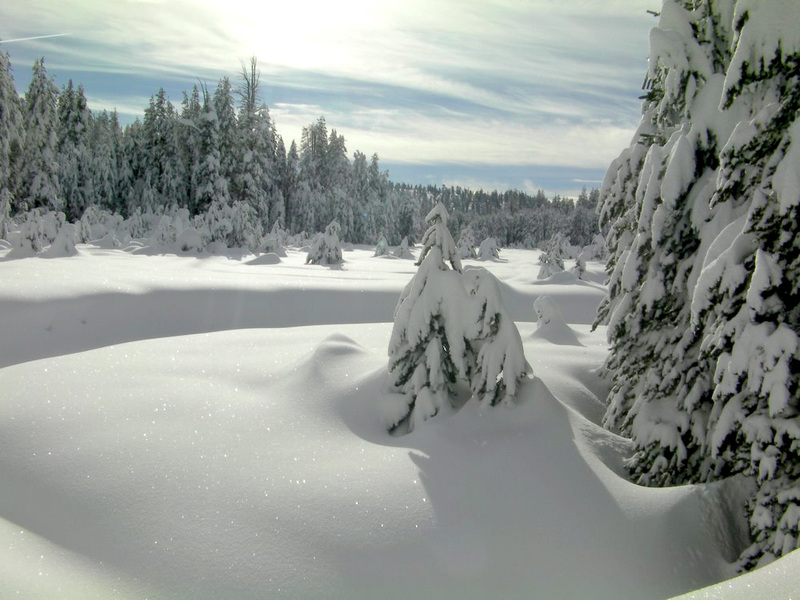 But being out in the forest, hearing only the sounds of snow crunching under our ski poles, the beauty and serenity we were able to experience was worth the work. When I remembered it was time for a snack, the Snow-Capped Macaroons were just the thing to keep us going for the rest of the miles. Lightly beat egg whites in a medium bowl until frothy. Stir in sugar, almonds, vanilla and salt, then fold in coconut. Use a tablespoon to drop batter into mounds 1 inch apart. Dampen hands with water to form into pointed mounds. Bake until edges are golden brown and the edges look dry, about 16-20 minutes. let cool 10 minutes on the baking sheets before transferring to a baking rack to cool completely. Make the glaze by using a double-boiler to melt chocolate, corn syrup and butter together. Use a spoon to drizzle the glaze over the tops of the macaroons, so that it drips down the sides in several directions. Sprinkle the tops sparingly with sea salt crystals. Refrigerate until the glaze sets, about 1 hour. Store in an airtight container up to one week. Makes 36 cookies.